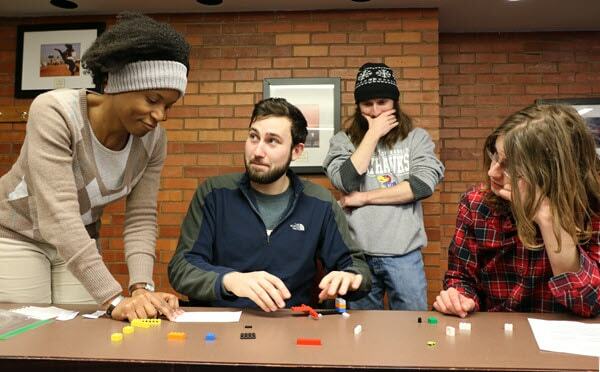 Students try to assemble a Lego creation after instructions were relayed from another room. Here’s some sage advice to start the semester: Don’t be a jerk. That comes from a student who will be an undergraduate teaching assistant for the first time this spring. Actually, he used a much more colorful term than “jerk,” but you get the idea. He was responding to a question from Ward Lyles, an assistant professor of urban planning, about things that undergrad TAs could do to set the tone in classes they worked in. More about that shortly. 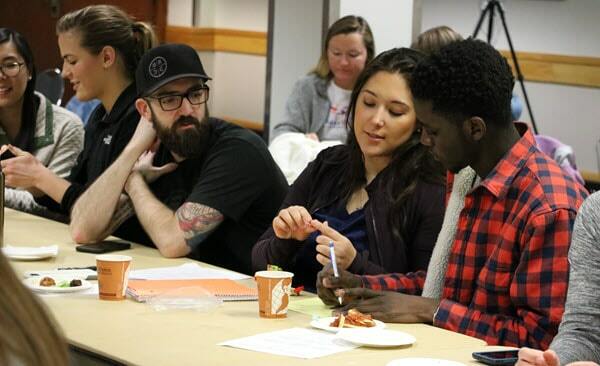 Lyles’s workshop on fostering an inclusive classroom climate was one of half a dozen sessions offered for 94 undergraduate assistants in STEM fields this week. Other sessions focused on such things as grading; team-building and communication; sexual harassment reporting; and expectations of undergraduate teaching assistants. Molly McVey, workshop organizer, checks in students at a training session for undergraduate teaching assistants. The workshop was organized by Molly McVey, a teaching specialist in the School of Engineering. 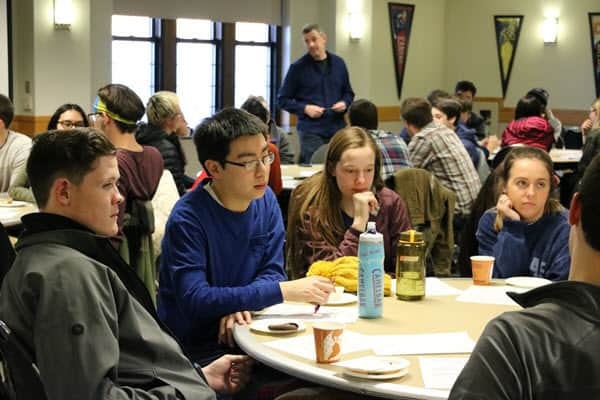 McVey organized the first such workshop a year ago after the number of teaching fellows (the name for undergraduate assistants in engineering) increased from four to 25. The school had no formal training program, so McVey created one. Other fields, including math, have their own sessions for undergraduate assistants. The program McVey started is unique, though, in that it brings together student assistants and instructors from a variety of disciplines. In addition to engineering, students at this week’s session came from biology, physics, and geography and atmospheric sciences. Department representatives had time to speak with students in their specific disciplines, but the overarching goal was the same for everyone: to help undergraduate assistants in STEM fields better understand their role in the classroom. McVey added another element this time, based on experiences with the previous two training sessions. Students assemble Lego creations at the workshop. The need for undergraduate TA training has grown as active learning in STEM fields has expanded over the last several years. These TAs perform a variety of duties, but their primary role is to move about large classes and help students with problem-solving, discussions and questions. Instructors choose the TAs from among the students who have taken their classes in previous semesters. That way the TAs know the subject matter, the class format, and the needs of fellow students. Undergraduate assistants have been instrumental in improving student retention and learning in such fields as engineering, geology and biology. Many other factors have been involved in those improvements, but the assistants provide key support as instructors shift courses from lecture to hands-on class work. They offer additional eyes and ears in large classes, and they provide additional contacts for students who might be reluctant to speak up in large classes. The training sessions this week helped undergraduate assistants understand some of the challenges they will face. Lorin Maletsky, associate dean for undergraduate studies in engineering, led a workshop in which teams of students assembled Lego contraptions using instructions from teammates who listened to descriptions in a different room and then raced back to explain – or try to explain – the appropriate steps. The scene was occasionally comical as students dashed in and out, gave colleagues blank looks and grimaces, and tried to put together pieces based on sketchy directions. 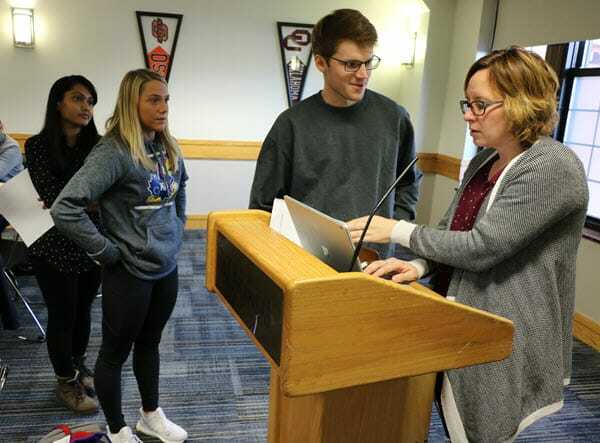 The exercise was eye-opening for those involved, though, in that it simulated the challenges that students face in trying to understand information that instructors provide in class. Sometimes that information is clearly understood. Most of the time, though, it comes through in patchy and incomplete ways as students struggle to grasp new concepts. Maletsky offered another analogy between the Lego exercise and teaching: Good teaching requires instructors and students to bring together many pieces, put them in the right order and create a coherent whole. “That’s not easy,” he said. In the diversity workshop that Lyles led, participants grappled with questions of student motivation, preconceived ideas, student perceptions, and class climate. Toward the end, he asked the undergraduate assistants to think about things they could do to help foster an environment that encourages learning. The student who told his fellow participants not to be jerks said he spoke from experience. An undergrad TA in a class he took in a previous semester was pompous and unapproachable, souring the atmosphere for many students in the class. He vowed to approach his job in a more appropriate way. Relate your own experiences so that current students better understand how you learned course material. Find something unique about each student to help you remember them. Pay attention to student struggles. Be an ear for instructors and listen for potential problems. Work at leading students to finding answers rather than just giving them answers. It was excellent advice not just for undergraduate assistants, but for anyone working with students. Tagged active learning, learner-centered teaching, STEM, workshops.